After more than 25 years of service to the Research Triangle Foundation, Elizabeth “Liz” Rooks has announced her retirement. Liz has served in the role of Chief Operational Officer and Executive Vice President, and has been key in shaping RTP throughout her tenure. The success of her career can be seen by all through the large companies that have located in Southern RTP, to the extensive jogging and bike trails that reach throughout the 7,000 acres. Her grace and charm will certainly be missed by all of us here at the Foundation! 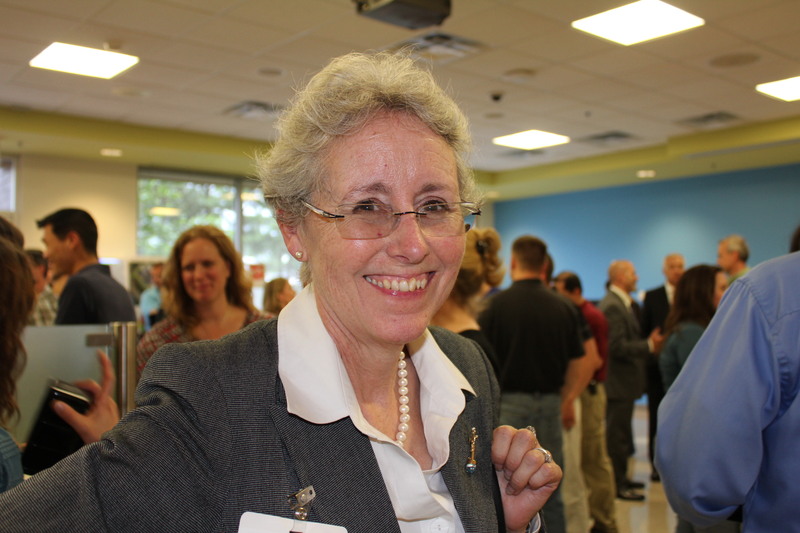 Elizabeth “Liz” Rooks has announced her retirement after more than 25 years of service to The Research Triangle Foundation of North Carolina, the nonprofit which acts as the stewards of The Research Triangle Park. Ms. Rooks will officially retire from the organization on December 31st, 2015. Ms. Rooks has been integral to providing leadership to The Foundation throughout her tenure with the organization. She has overseen multiple projects that have helped shape the growth of The Research Triangle Park, and the redevelopment effort at Park Center. A planner by training, Ms. Rooks has worked on many long-range and short-range projects which have helped to shape RTP’s 7,000 acres over the years. She oversaw the implementation of the master plan for the southern portion of RTP which began in 1990 and transformed RTP south of Hopson Road from woodlands into the area which now houses Cisco, NetApp, Biogen, Eisai, Lenovo, Credit Suisse, Fujifilm-Diosynth and Alexandria Innovation Center. More recently she provided the in-house technical oversight for the preparation of the RTP Master Plan which was completed in 2012 and was the first comprehensive master planning effort for RTP since the original master plan was prepared in 1960. She has also overseen the construction of three lakes in Southern RTP that serve dual roles as beautiful amenities and storm-water retention, the RTP Headquarters located at 12 Davis Drive, a Park-wide wayfinding system, and over $39 million of new road construction. Ms. Rooks has also served as the lead when it comes to all the recreational amenities throughout RTP. There are miles of jogging trails, mountain biking trails and numerous sports fields. Throughout all the projects over the years, Ms. Rooks has been able to maintain a positive, conscientious and thoughtful spirit. This attitude has no doubt attributed to her success over the last 25 years, and why she remains the “go-to” person for anything RTP-related across Durham and Wake counties. Her knowledge of the Park, of all its unique zoning requirements, and her commitment to providing superior customer service, have been hallmarks of both her outstanding career and simultaneously, the continuing success of RTP. Ms. Rooks’ position of COO will be assumed by the current Vice President of Business Development, Mason Ailstock. He formally took the title on June 1st, and will join current Chief Financial Officer, Linda Hall, on the executive leadership team. Ms. Rooks will continue to work with Mr. Ailstock through her official retirement date. Mr. Ailstock has been with the Research Triangle Foundation in the role of VP of Business Development since May 2012. Previously, he served as the Director of The Advanced Materials & Innovation Research Park and as a Global Partner Manager with the Clemson University International Center for Automotive Research. He has nearly 15 years of experience with research parks, and has worked on multiple master planning and development projects throughout his career. Currently, he serves on the Board of Directors for the Council for Entrepreneurial Development, the Association of University Research Parks, and the Durham Technical Community College Foundation. “Mason has done an exceptional job of leading his team throughout his time here at the Foundation, and I know that he will continue pushing RTP forward in his new role,” says Geolas.